Last week I posted about the stereotype that Black people love watermelons, explaining that it originated with efforts to justify slavery. Black people were simple, slavery proponents argued, so a delicious watermelon was enough to make them happy. 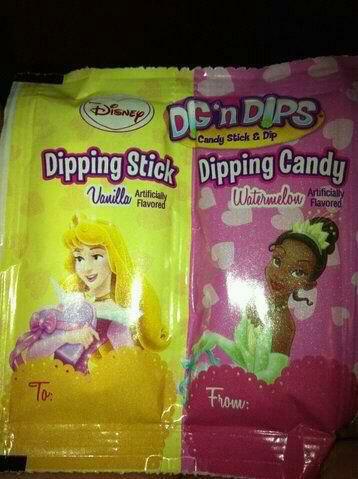 In light of this history, as well as the ongoing racism, the product below — a Valentine’s Day candy that pairs two Disney princesses — is rather, let’s say, insensitive. The White Cinderella Aurora character decorates the vanilla flavored side; the Black Tiana character decorates the watermelon flavored side. Just… wow. Thanks to Caroline H. for forwarding this along. I checked the source, but couldn't find any justification for the claim that the stereotype existed prior to the late 1800's. I don't recall any mention of chicken or watermelon in Stowe, but I wasn't looking for it. What's the earliest primary source for images of blacks with watermelons? Wow, this is simply amazing. The speaks to the lack of diversity in America's boardrooms and places where decisions are made. It's amazing to me that no one caught this or raised an objection. "Which Disney character should represent the watermelon flavor?" - "the black one!" Is that even Cinderella? She looks more like Aurora/ Sleeping Beauty to me. Anyway, that's terribly off-model for either one. Tasteless flavouring aside, it's rather sad that older characters with their distinctive looks are being homogenized to blandness in the Princesses merch line. My father worked with Max Robinson, the first black national news anchor (he shared the ABC Evening News with Peter Jennings and Frank Reynolds for a time). Once they were out at lunch, and Robinson, looking over menu, mentioned that as it happened, he did really like watermelon, but felt he could never be seen eating it. And the white, blonde Disney princess has Vanilla flavored, same stereotype just a different color. Did anybody ever see them in person? When you google it, the box has four princesses and three flavors. On the cover it shows Belle as vanilla. Do you think they might have mixed up the princesses and the flavors? Meaning that this may just be a random combo. Hilariously the racial group with the highest per capita consumption of watermelons in the US are Asian Americans. Come summertime, I can't think of any days where I'm not eating some form of watermelon. Am I insulting African Americans if I eat watermelon. If an African American eats a watermelon is s/he guilty of reinforcing a stereotype? Nevermind, the problem fixed itself. Nevermind. The problem fixed itself. Matching the black princess up with the watermelon flavor appears to be random. The question is: given that one of the princesses is black and one of the flavors is watermelon, is the racist dog whistle inevitable? Does anyone know when and how 'vanilla' became a synonym for 'boring and bland'? It is a real, authentic flavour in itself, and has an 'exotic' history in Europe; it seems weird to me that it would be considered such a nonentity. "You can't just wish upon a star," the movie says. This pull-yourself-up-by-your-own-bootstraps mentality ignores whole sections of people who've historically been barefoot. I had honestly never heard of this stereotype before. I wonder if it's more of one that stayed in the south more. If there is a kernel of truth in it I think it can be said of any race. Watermelon is freaking good maybe it was just one of the cheapest things slave owners could give to their slaves, or rather let them have it, and it became a symbol without real reason. I don't think it's still hung onto though by the majority of the population. Look how much watermelon is used in high end restaurants these days. I'm betting it came down to some person who was given the task of assigning the flavor to a princess and it just happened vanilla seemed logical. She looks like living vanilla. If there had been chocolate as a flavor I bet they would have given it to Tiana. But then they thought, "oh crap that's really racist we need to pick a new flavor." So they picked out watermelon instead. The more people let this stuff go it will fade away as all stereotypes should. At least that's how I feel about it. yeah and Mulan is cat flavored and Pocahontas is alcohol, and jasmine is felafel. ...can I please point out you originally put Cinderella, when in fact Aurora is sleeping beauty? The assigned princesses seem like something that started out as a bad joke that just happened to make it to final printing. It's happened before, it's most likely ignorance rather than hate. 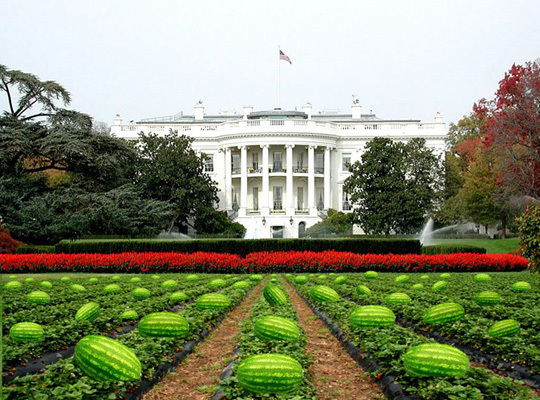 So the fact that when I see all those watermelons on the White House lawn my first thought is "those will be a really good defense against zombies" (Plants vs Zombies) means that I'm not racist but a huge nerd. If you are not a person of color, and what society considers, a minority, you will never understand the comments, the pictures and all the other deragatory things that goes with being of a person of color. Disney has always painted a negative view or picture of African Americans. In the very old pics of Afr. Amn you see a very dark person eating watermelon, also look at Disney's very old cartoons and see how African Americans are depicted. Even the current Disney TV shows. How many African Americans do you see on these shows? Maybe one per every 3 shows. I am not surprised at Disney, I do not accept it, but not surprised, based on their history of racism. My friend went into a Disney store at Disney World and brought home a metal plate that was posted on the wall of the store. He asked what was it? The sales people didn't know, possibly teenagers, they told him he could have it. It is a pic of a very dark person with racist comments on the plate. The PC police back in full force. Let's ban everything because someone finds it offensive. One day we will be eating out of colourless bags with a non-threatening black arial font. I thought it was rather funny. It's not like it was fried chicken flavor. And any self-respecting black man would laugh at that joke. I know, because I have black friends, and we can trade jokes like that. Can't you people? Ok folks going to share my feelings on it. I thought we were past all this "this is racist and that is racist" crap. Why get up in arms over stuff like this when this is actually a diversion from true issues wrong with this country. Is this image racist? Maybe, if you let it affect you as such. Hey guess what I'm black and I like Watermelon....so what its a food. I eat food, along with Chicken too. So what? Why don't we worry about not only the state of our culture as black people, but the state of America as Americans as well. Think I have had enough of this crap. Focusing on these small things instead of tackling the big issues. Is Racism dead? Of course not. Will it ever go away? Maybe if we live in the Star Trek World. So why waist time trying to knock down a wall with paper and words. I was with a black friend and a white friend and we were eating watermelon and the black guy wouldn't eat any. I asked him to eat some and he said he'd never had any before. He finally got a piece, ate it and didn't say anything about how remarkable it was or how he can't believe he hadn't tried it before now. Leading me to believe, this was in fact not the first time he ever ate watermelon. With that being said, this article is pathetic. There are people dying in the world, and making up racism is what this author spends her time and efforts on. And she's got a PhD? Wow, Our future is going to be pretty bleek.